I have been a fan of George Foreman’s Grills for years and love how convenient it is to make healthy meals for my family in a snap. I was thrilled to have the opportunity to try the new George Foreman Evolve Grill and it is the best of the product line in my opinion. The George Foreman Evolve Grill is so versatile and you can customize it with additional insert plates to fit your needs. 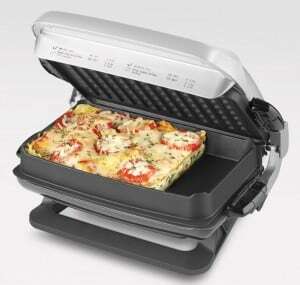 The George Foreman Evolve Grill comes with four interchangeable starter plates to allow you to grill, cook with the deep dish pan and even a mini-slider burger insert. You can further add to your collection with seven additional pans and accessories to make waffles, omelets, cupcakes and muffins, Panini’s and more. The first recipe that I made was a grilled salmon that I had marinated in fresh lime juice from our key lime tree, sea salt with dab of olive oil. It turned out moist and delicious in five minutes. I set the digital time and temperature controller and that was it….as simple as that. The non-stick grilling tray was perfect for easy cooking. My family really loved this meal and I loved that all the extra oil drained down into the custom drip tray. The second recipe I made upon special request from my family was buffalo slider burgers using the mini burger accessory. Buffalo meat has a tendency to dry out very quickly but these sliders were moist and tasty. I will definitely make these again very soon. My favorite feature of the George Foreman Evolve Grill is that you can easily remove any of the grilling or accessory plates to wash it in the sink or dishwasher and clean up is therefore very easy. When I first told my husband about the George Foreman Evolve Grill he expressed concern about yet another kitchen appliance taking up space in our small kitchen. Once he saw how compact the George Foreman Evolve Grill actually is and how many features it has he quickly changed his mind. 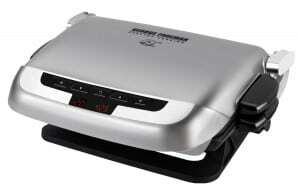 You can also watch a demonstration to see how the George Foreman Evolve Grill works. 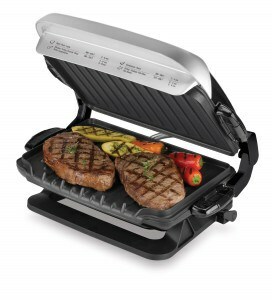 You can purchase the George Foreman Evolve Grill for only $129.99 and Evolve accessories starting at only $14.99 and shipping is free on all orders over $99. I have already hinted to my husband that I would love to have the Evolve Waffle Plate Grill Set for $27.99 under our Christmas tree. Like George Foreman Cooking on Facebook. This looks like such an amazing grill! I also like the Counter Top Oven & Rotisserie. I would like to try the Smart Kitchen Multi Cooker.